Nick Buoniconti was traded to the AFL's Miami Dolphins in 1969. He continued to play well with the Dolphins, in 1969-1974 and 1976, and made the AFL All-Star team in 1969 and the NFL Pro Bowl in 1972 and 1973. Buoniconti was also named All-AFC in 1972. His leadership made him a cornerstone of the Dolphins' defense. During his years there, the team advanced to three consecutive Super Bowl appearances, the second of which was the team's 1972 undefeated season. In 1973, he recorded a then-team record 162 tackles (91 unassisted). He was named to the AFC-NFC Pro Bowl in 1972 and 1973. He was named the Dolphins' Most Valuable Player three times (1969, 1970, 1973). On November 18, 1991, he was enshrined on the Miami Dolphin's Honor Roll at Joe Robbie Stadium. 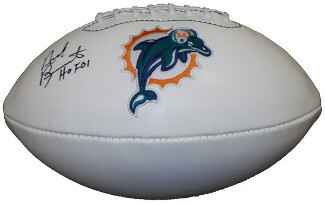 Nick Buoniconti has hand autographed this Miami Dolphins Throwback Logo Football with HOF01 inscription. MAB Hologram and Certificate of Authenticity from Athlon.